7 months have gone by in a blink of an eye. I sometimes don’t realise how big my daughter has grown till I look at some of the things she does. Like how she acts coy whenever I whisper sweet nothings in her ears, or when she wants me to carry her when I reach out my arms to her, or most recently last Saturday when I see her sitting on the baby chair at the restaurant. We were doing a spot of shopping at Vivocity when the hunger bug struck us, well Aida to be more precise. So since we have not sampled eating at Earle Swensens, we thought it was a nice time to try something different there. I was blown away by the decor and interior design of the restaurant. But by the end of the meal, we were blown away by the expensive bill we picked up. You see, we just shared a Fisherman’s Catch meal, plus a Hot Latte for her and a Tropical Float for me, washed down with a double scoop ice-cream which we both shared. Oh and not forgetting taking away an Old-Fashioned Vanilla pint tub home. I was expecting the meal to be about $40-$45 at the most but we ended up picking a hefty bill of $57++, of which 7% is from the dreaded GST and 10% for service charge. In times like these, one really needs to tighten up one’s belt and not splurge unnecessarily. We don’t eat at posh restaurants that often, maybe about once every three months or so, so it’s ok if we had burnt a small hole in our pockets then. Yes, it’s mind boggling thinking of the prices just by looking at the small amount of food we ordered. We are most definitely going to be more stringent, picky and thrifty from now on. I guess the good old hawker food is still more affordable and more filling if you ask me. Anyway, back to my daughter Syahindah. She was not content on sitting in her stroller while her parents sat on the lush, cushioned seats. So she made a lot of noise and yours truly had to request for the baby seat. She was all smiles when she sat on it and it was then I realised how much she had grown. And it was her first time sitting on a baby chair in a restaurant cos previously before this, she had always been in the stroller. 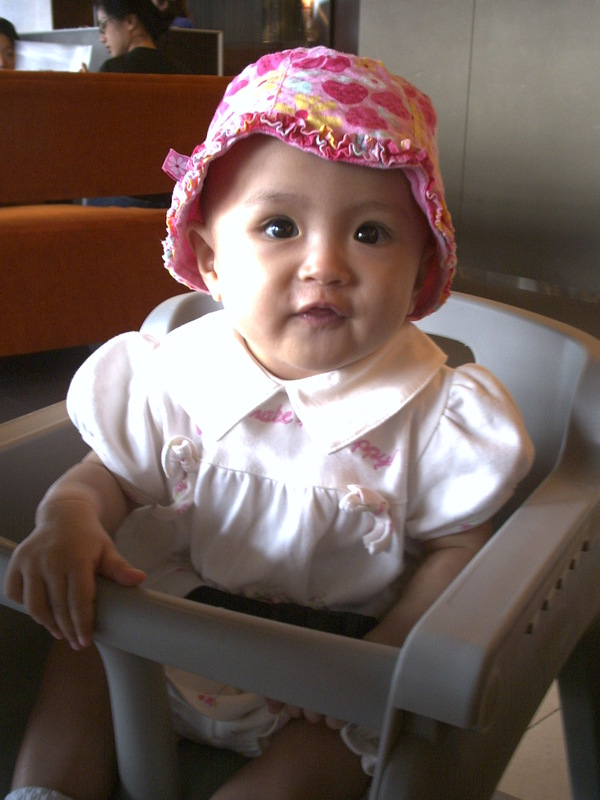 Previously, Aida and I were not brave enough to let her sit on walkers or Bumbo seats till much later. Cos my mum did warn us on the dangers of affecting the child’s backbone in the long run. Some of my mum’s cousins are suffering from back problems when they grow older cos their late mother put them in walkers when they were just 3-4 months old. Fearing that, we took the safe route in not getting ourselves a Bumbo seat or a walker, even if I had secretly wanted the former, seeing how cute she would look sitting in there. Yes, I’ve seen some friends putting their kids on it and how cute they looked. But this fear of upsetting her backbone development was too strong to resist. Cos we all know the backbone and spine are two very important components in our anatomy. If you think I’m hitting out at parents who buy their kids stuff like these for their child’s development in this entry, no you are so wrong. Each set of parents have their own ideologies and methods of bringing up their kids. I have the utmost respect for the way all my friends bring up their kids and I always use the better ones as a form of guide to bring up my own child. No matter how much their styles differ from us, the one common thing we have is we want to bring our children up the best way possible – to remain healthy, to get the right education, moral and religious values. As parents, we are just afraid of what might happen in future so we set out to nip things in the bud, learn from people around us and share knowledge, with a lot of fear and worry along the way, but I guess that’s normal being parents, eh??? So cheers to all parents out there…!!! Hey bro…. not that I take offend or anything… but since you said you wanted to get the bumbo seat… maybe I should just share with you this… I was too concerned about the bumbo seat… scared that it might affect Qal’s backbone… but the bumbo seat has been approved and made especially for babies posture as to not affect their backbone growth… I actually asked Qal’s doctor about it too and she too stands by the Bumbo seat and said that it’s not bad for my baby. So maybe you can get it afterall.. 🙂 But like what you said… to each their own lah… just sharing what I know.